Welcome to Super Coupon Woman Foundation Inc! A newly founded Non Profit Organization with a mission of inspiring, teaching, and helping others with the power of coupons! Super Coupon Woman A.K.A. Tina Klein (Me) knows what it’s like to go through hard times…When I was newly divorced, and my children were young..things were tough! I look back.. and wonder how I survived it all. The answer is: A lot of random strangers from my own community that I would never have a chance to meet stepped up to help me through those difficult times whether it was local resources paying an electric or water bill that was going to get shut off any minute, the food stamp assistance I received for a short period, or someone picking my children’s names off of a tree to help them have a better Christmas..It was all appreciated, and did not go unnoticed. I am a very stubborn person, and I did not want to accept any help, in fact it took a lot of convincing from others to do this, but sometimes we have to swallow our pride, and do what we need to do for our kids. I started looking for ways to save money as they became teenagers, they started needing all those things girls just have to have…make up, hair color, money for the movies ect. I had tried to coupon in the past but never seemed to save a whole lot. In 2008, I gave it another try, and this time I understood the concept, I started asking my friends and family for their unused coupons, and asked the food pantry to save coupons for me also…Soon I was able to turn in large donations to the food pantry several times a year. I was always giving myself a challenge to meet. I did several $500.00 donations, and 1,000 holiday donation which really was exciting that I could do that as a single mom with a small budget. I have had a few news stories that have allowed me to hopefully inspire others to donate to their communities with the power of coupons. 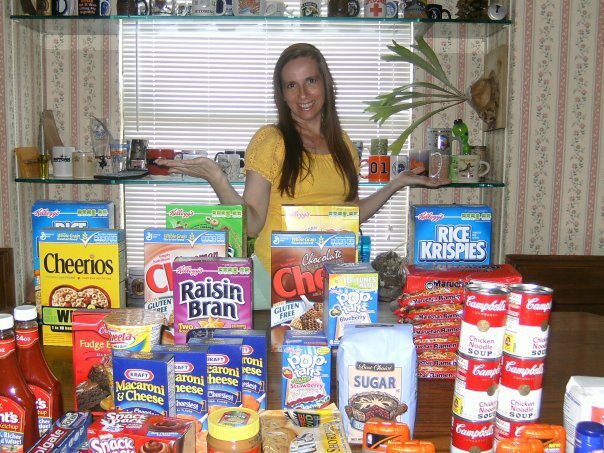 In 2010, I founded the $100,000 coupon challenge where couponers around the U.S. join together to donate $100,000 in donations to their local food pantries. 2015 will be our 5th anniversary where I will attempt to donate 50,000 throughout the year…Now that’s a challenge! I created the Super Coupon Woman Foundation in hopes of working one on one with some of the families we are able to help, and not only help my community, but others throughout the U.S. I am constantly creating new challenges for myself and others to help keep donating a priority and make it fun at the same time. I vowed to give back if I was ever in the position to do so… Since 2009, I have been able to give back well over 50,000 to those in need in my community thanks to the power of coupons! (That’s pretty amazing for a single mom on an O.K salary.) The $100,000 Coupon Challenge has calculated over $200,000 in donations! I plan on continuing to pay it forward and inspiring others to do the same for many years to come. Won’t you join me in paying it forward in your community. Remember…no donation is too small to count…It all adds up and helps others which matters most!